I haven’t made a thorough study of the matter, but I’d venture to say that if you’re looking for information on the gardens that produce your Indian single-estate tea you’re likely to come up dry in many cases. 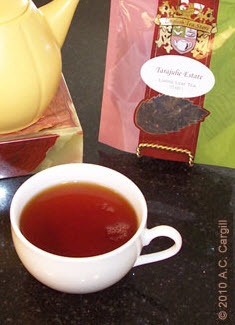 Take Tarajulie Estate, for instance, who produce the fine Assam tea that’s the subject of this review. While you can find a number of vendors who sell their tea and a number of other reviewers who have also weighed in on its merits, it’s a little trickier to find out anything about the estate itself. Between myself and my esteemed editor, about the best we could come up with is located here. Which is hardly a necessity when it comes to appreciating the finer points of any tea, but just as a wine fancier might like to know more about the vineyard that produces the vintage they’re drinking so do some of us tea people like to know about the estate that produced our tea. But enough about that. For a long time I found myself jumping back and forth between black and green tea, growing tired of one and moving on to the other and then switching back again. Lately though, I’ve been drinking black tea almost exclusively. I can’t figure out why but I’m going to hazard a wild guess and say it might have something to do with the colder weather. In any event, I’ve been lucky to get my hands on samples of a few varieties of my favorite black tea – the robust type that hails from the northeastern state of Assam. I’ve had the pleasure of reviewing two of the English Tea Store’s Assams recently, starting with their Organic Assam TGFOP, which I reviewed here. I liked that one quite a bit but I liked the next one – the Borengajuli – even better. Now it’s on to the Tarajulie, which I liked even better than the Borengajuli. I don’t often use those high-falutin’ descriptors (oaky, persimmonish, faint notes of kerosene) favored by beverage reviewers, so I’ll just say that the Organic Assam and the Borengajuli had that robust, smooth and richly flavored profile common to the best Assam teas. As for the Tarajulie, I’ll just say that it’s got all of those qualities, but in greater abundance. Which definitely makes it worth a look, if you go for this sort of thing.